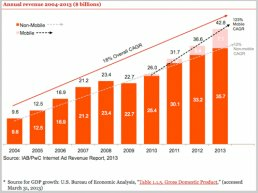 Which Form of Digital Advertising Is The Most Effective? The age of the Internet has taken the world by storm in the last decade and has changed the way consumers behave and buy products. With this change has come a new type of consumer that is more educated and able to do vast amounts of research before making a purchasing decision. It has also brought about a consumer that spends a lot of time online, whether it is for personal or professional reasons. This gives marketers new opportunities to interact with their customer base and reach out to different audiences. This is where digital advertising is able to aid businesses in reaching more of their target audience in less time. The world of digital advertising, although relatively new, is still rooted deep in the fabric of traditional advertising. This means that companies are able to add a digital form of advertising to existing or upcoming campaigns that have always relied on traditional mediums. Tying your offline and online strategies together sets your company up for success in its next advertising campaign and will do well in reaching your specific audience. Google Adwords- The all-knowing and all-seeing advertising platform offered by Google is able to handle a variety of different campaigns and spreads across a vast majority of the Internet. Advertisers can use Adwords to place media on Google’s search engine, specific websites within the Google Display Network, or even on YouTube. A very effective tool in targeting specific audiences, this platform should be in the front pocket of every digital advertiser. Social Media Advertising- Because social media companies like Facebook and Twitter have been going public, it makes sense that they now have many shareholders to please. This is where social media advertising has really ramped up and become a mainstay of digital advertising. With immense targeting capabilities by both demographics and psychographics, social media has proven to be a valuable asset when launching a new campaign. Digital Radio- A medium that advertisers should consider comes in the form of Internet Radio. This includes the big players like Pandora and Spotify and can be a really good way of getting the word out. Although it may be a little more costly than other forms of digital advertising, you are able to target your audience by location and interests, making it a valuable form of advertising. Video Advertising- Advertising on channels like YouTube and other video services has proven effective for many brands. There are many different options to choose from as an advertisers, some being 15 second spots and others being 30 second spots that give the user the ability to skip the ad after 5 seconds. This presents a unique challenge to advertisers, forcing them to create compelling and creative advertising. Cabvision is a digital screen network operated in London Licensed Taxis.